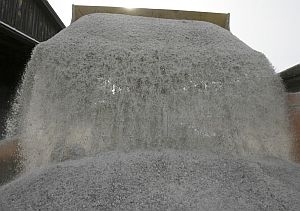 (Host) Public works directors have stored up a large supply of road salt to avoid the kind of shortages that left roads slippery last winter. But, as VPR’s Ross Sneyd reports, it will cost more to keep highways ice-free this year. (Sneyd) Most of us think about winter driving only when the temperatures dip and the first hard frost settles in the valleys. Highway crews don’t have that luxury. They have to fill their salt sheds well in advance of the first snowflakes. They thought they’d done that last year. But by the middle of an especially snowy winter, they were running out. (Sneyd) Steve Goodkind is public works director in Burlington. The city couldn’t get resupplied regularly and it nearly ran out of salt several times. So did towns around Vermont – and around the Northeast. Goodkind doesn’t want that to happen in Burlington again. He ordered his crews to clean out unused sheds to make room for extra salt for this winter. (Sneyd) That’s three or four times what Burlington usually has on hand at any given time. It should get the city through maybe a third of the winter. Some public works departments tried to work together. They pooled their resources and sought a single bid in the hope they’d have more clout with a larger order. The state Transportation Agency has already filled all of its sheds, except for one that’s under construction. VTrans now has 90,000 tons on hand. And according to deputy operations director Scott Rogers, that supply has cost the state a lot more. (Sneyd) The salt industry says prices were driven largely by higher fuel costs. The industry also has struggled this summer to meet demand. States and cities across the Northeast and Midwest ran short last year. They’ve increased their orders this year to avoid that again. Illinois, for example, boosted its order by one-third – more than 400,000 tons. That’s increased the pressure on distribution networks – and driven prices even higher. Three state highways are still closed as much as ten days after sections of the roads were washed out in flash floods, and though crews have dumped tons of fill and rebuilt culverts, the going has been slow.